1. Preheat the oven to 180˚C, gas mark 4. Put the sharon fruit, cut-side up, in a roasting tin so they fit snugly. 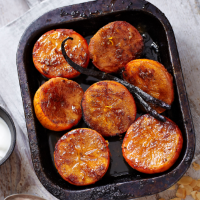 Squeeze the orange juice over the top, then drizzle with the honey and scatter over the zest, spices and vanilla pod. Cover tightly with foil and roast for 35-50 minutes. The timing will depend on the size and ripeness of the fruit, but when cooked, the fruit should be soft yet still holding its shape. 2. Set the grill to high (about 250˚C). Remove the foil from the fruit, spoon over the cooking juices and grill for 5-10 minutes, until golden. Serve with a spoonful of Greek yogurt on the side, if liked. This recipe was first published in Thu Jan 01 16:39:06 GMT 2015.